Saturday & Sunday Fall Festivities begin Saturday, Sept. 8th! The fun begins tomorrow! Our corn maze theme this year is Jack and the Beanstalk. 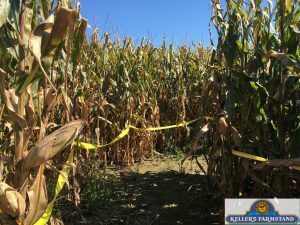 Roam through 10 acres of corn bliss as you search for the checkpoints. Our kids play area will be open as well as wagon rides, grain tables, animal barn, and more! We’ll be making our delicious apple cider donuts, too. Our apple orchard is open if you want to stroll the lanes for fresh apples. Lots to do here on the weekends! See you soon!